If you're old enough, you probably remember fondly the warm glow of vacuum tubes from inside the family television or radio but likely don't wish for the good old days of vinyl records, preferring the convenience of Compact Discs. A Tokyo-based company is hoping to bring together the best of those worlds and do it with style. Supercent has combined a CD player and radio with an amplifier built with vacuum tubes, or valves, and hopes to begin sales next year. 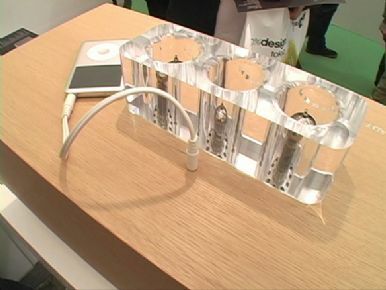 The device even includes a jack that Supercent used to connect an iPod for a fusion of cutting edge digital audio technology with 50-year old amplification technology. It's been built into a wooden case designed to look like an old-style radiogram. A large grill covers the front of the player, which is about 60 centimeters long by 27cm high by 29cm deep, and it sits on four thin silver legs. "I think it's good to see the lights come on when you use audio, it's a fantastic moment," said Atsushi Koike, one of the two designers behind the product. He was demonstrating it at Tokyo Designers Week 2008, an event held over the weekend in Tokyo. "I feel like these vacuum tubes are like musicians playing music on a stage," he said of the three tubes that protrude from the top of the player and glow a gentle orange when in use. "These guys are playing music in front of you, that's the concept." Touch-sensitive buttons are inlaid along the top of the player but aside from these very basic controls the entire unit is devoid of anything more significant. "I wanted to buy an audio system for my father," said Tadahito Ishibashi, the other designer who worked on the player. "But all of the ones on the market were packed with so many functions and buttons and were just too complicated to use to I made this one." Vacuum tubes are fondly remembered by many for the warm sound of the audio they produced and some audio aficionados today spend large amounts of money on such amplifiers completely shunning more modern digital products. In a modern twist the player's CD's digital display doubles as a countdown clock to the time the vacuum tubes are warmed up and ready for use and serves to remind children of the digital generation that 'switch on and go' isn't something to be expected from vacuum tubes. In a demonstration it took about 20 seconds for them to warm-up. Supercent hasn't yet finalized the price or specific launch plans. Updated at 9:42 a.m. PT to include an image of the Supercent audio player.